If you’ve been a long-time reader of the blog, you’ll know what big fans we are of Katharine Hepburn. Last Fall, we made her famous Lace Cookies. The ones that were in constant request at both her city house and her country house, so much so, that extra batches were kept on hand either freshly baked or on standby in the freezer. Was Katharine always the one baking away? Sometimes. 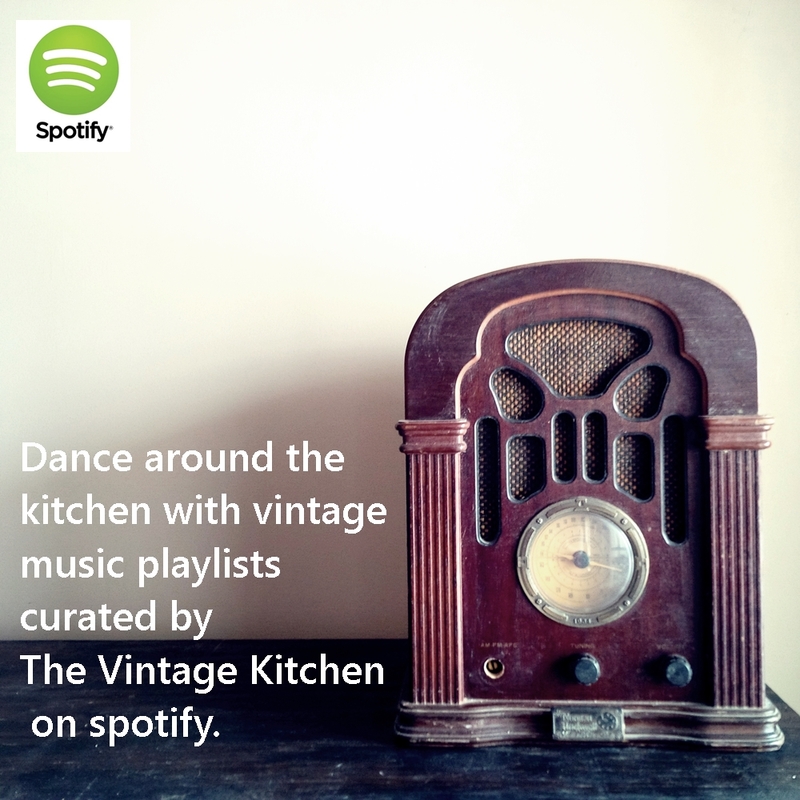 But mostly it was Norah, Katharine’s longtime personal cook, domestic helper and treasured friend. Norah Considine. Photo from the book At Home With Kate. 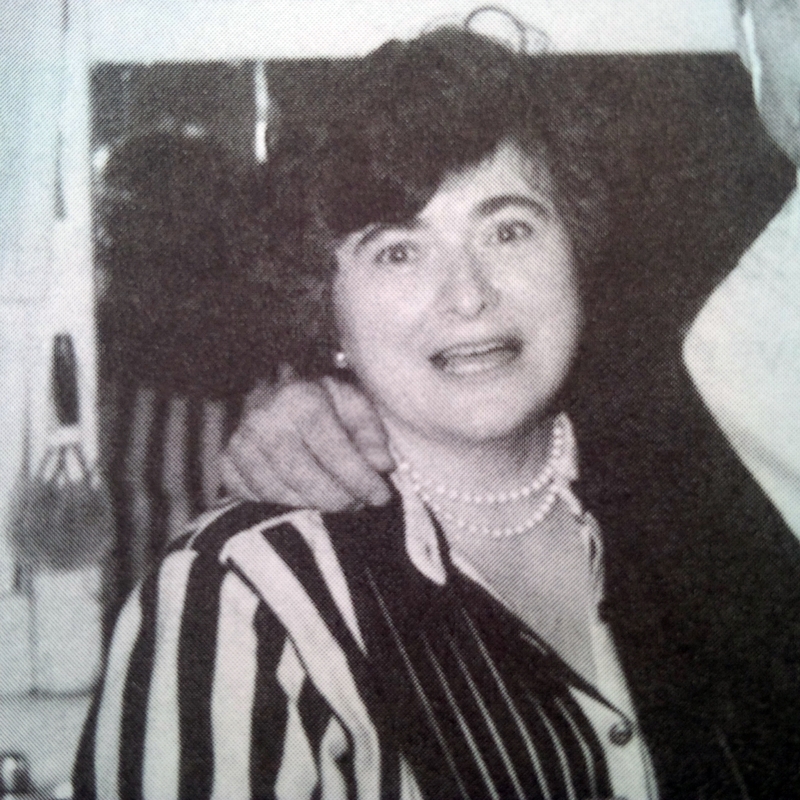 Norah Considine worked for Kate for 30 years, day in and day out, making the kind of food that Katharine loved best – simple, hearty and well-balanced. Sometimes though Norah would sneak-in her own recipes, a combination of food from her Irish heritage and dishes that she made up on the fly to feed her five kids. With guests continuously coming and going from the Turtle Bay city townhouse and from Fenwick, the Hepburn family compound in Connecticut, mealtimes were always eventful and Norah was always up to the task to make them as delicious as possble. Cooking for everyone with equal aplomb, making meals that were thoughtfully prepared and proven to please, Norah was accustomed to feeding an ever-evolving crowd that ranged from household staff to famous celebrities. In turn, she became a little bit famous herself, with returning guests regularly requesting her rum cake, or her beef stew, or her creamed chipped beef on toast. Even though Kate liked to run a tight ship, she was generous with her friends and her staff. 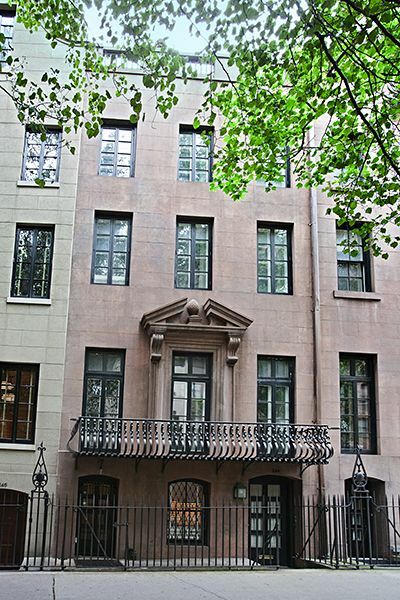 Every year on St. Patrick’s Day, Kate would leave New York City and head to Fenwick, so that Norah could have the townhouse to herself to entertain her friends and family for St. Patrick’s Day. This party was no small gathering, sometimes counting over 100 people or more. But no matter what the attendance numbers were, large or small, Kate always wanted Norah to be the star of the show for her special event, so she’d graciously leave in order to give Norah the run of the place. For a change, Norah would cook for herself and her friends, and she would relax into the traditional celebrations of her heritage day. At these parties, you didn’t always know who was going to be attending – friends and family flew in, drove in and walked over from all corners of the city, the country, and the world. There were homemade costumes and contests, musicians and dancers and tables full of traditional food and drinks. 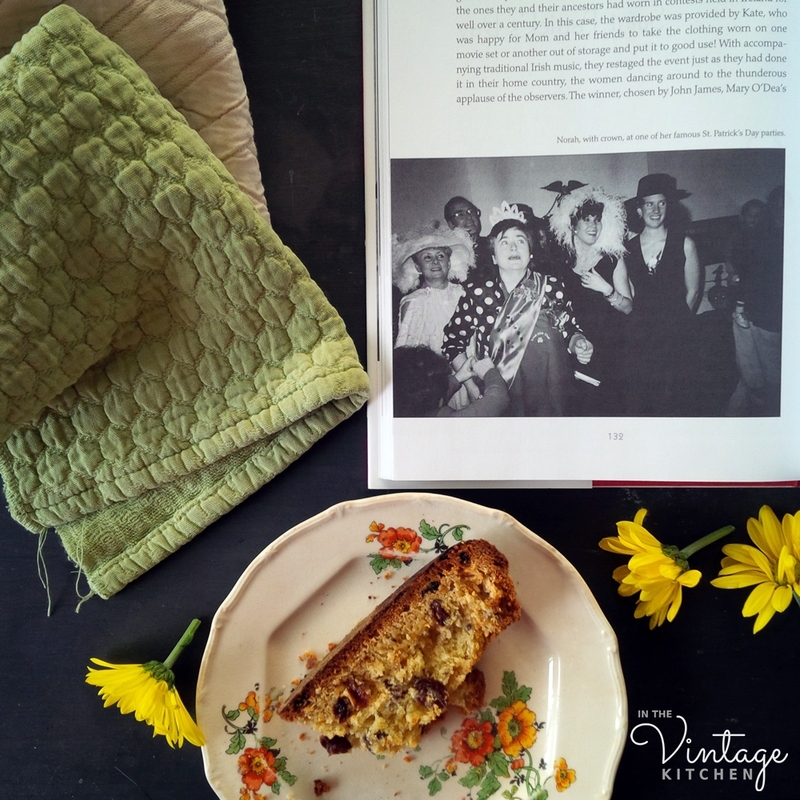 One of the edibles Norah always made for these parties was her cousin’s Irish Soda Bread, a recipe that traveled all the way from Ireland. 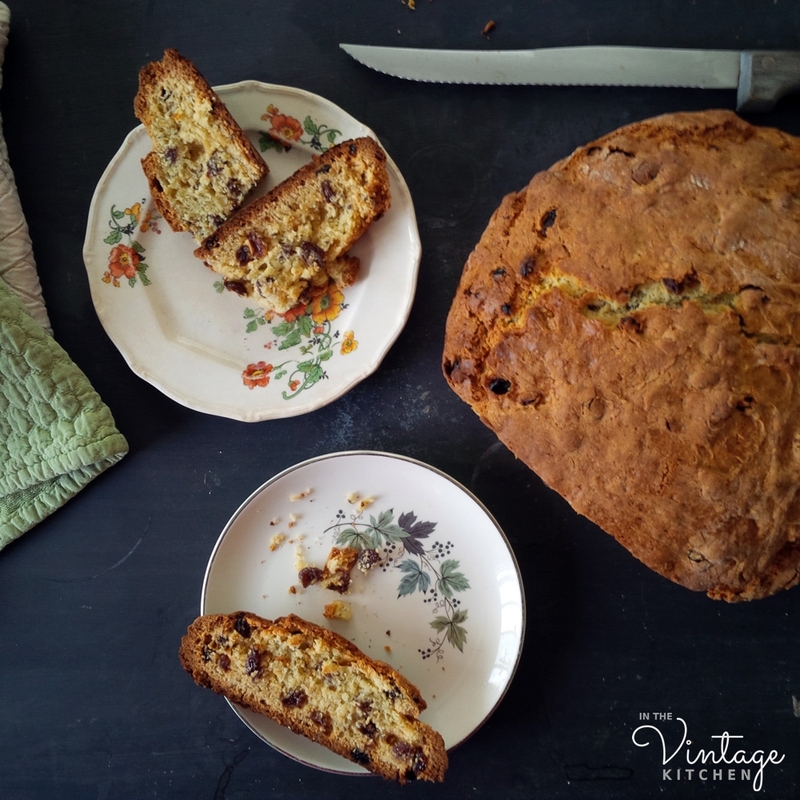 This was the soda bread recipe that was legendary in Norah’s family and in Katharine’s house. It has fed hundreds of people throughout hundreds of parties and like, Kate’s Lace Cookies, it represents wonderful memories and extraordinary experiences. Not bad for a humble bread born out of lean economic times. 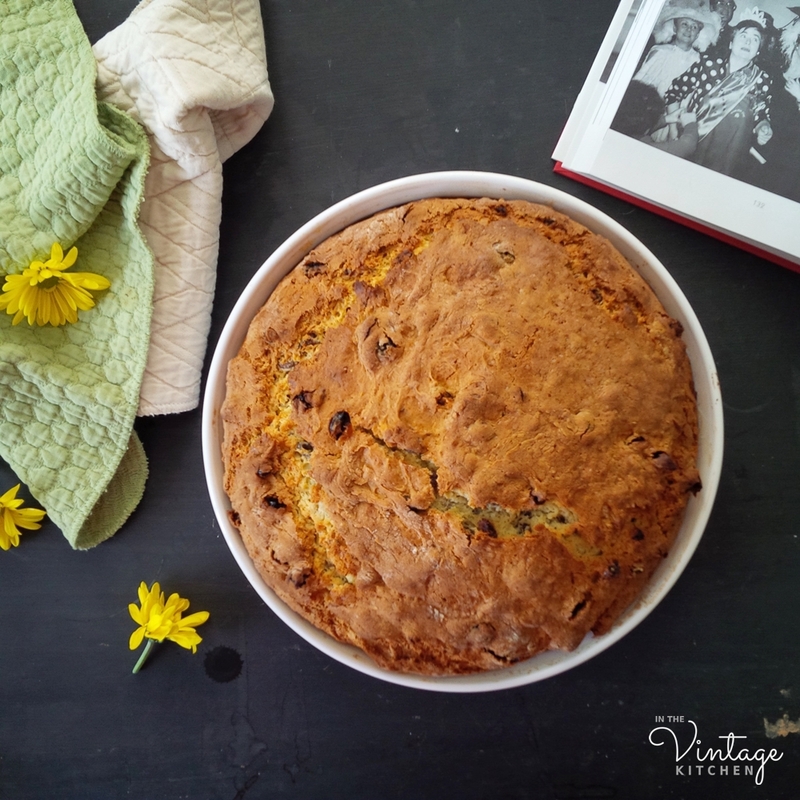 With a consistency somewhere between a fluffy cake and a crumbly cornbread, Norah’s cousin’s Irish Soda Bread is a decadent little treat both sweet and hearty in a satisfyingly nourishing way. One slice makes you understand how it fortified a country for two and half centuries. Although technically, not really Irish in origin (the Native Americans were the first to come up with the general idea), Ireland has been proclaiming soda bread a national staple since the 1830’s. 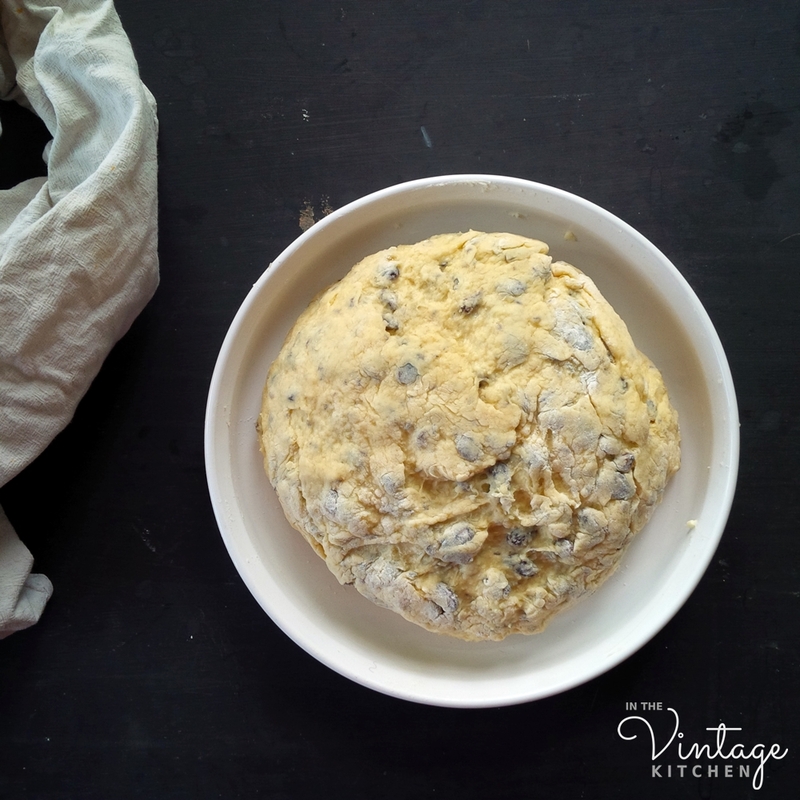 Because it contains no yeast, an expensive ingredient in times past, soda bread gets its bulk from baking soda which chemically raises the dough when combined with flour and any acidic property like sour milk, buttermilk, or in Norah’s case, sour cream. 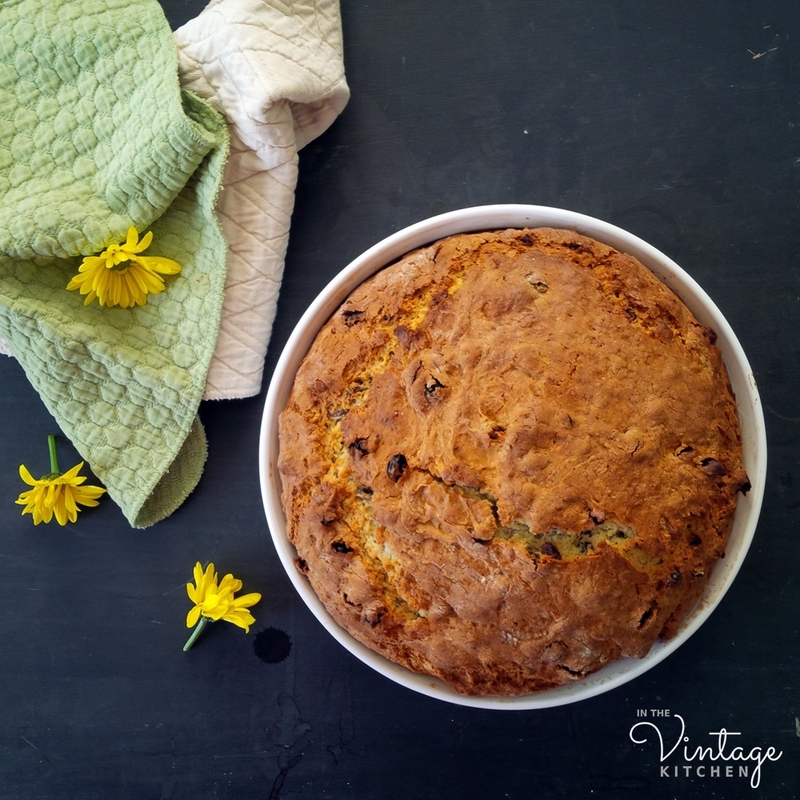 Some people even add a touch of orange juice or lemon rind to their soda bread for an extra dose of certainty that the chemical reaction will yield a tall and fluffy loaf. That are lots of variations on the traditional soda bread recipe, but Norah’s is interesting because it includes caraway seeds and sour cream and just a little bit more butter. Super fast and easy to put together, this recipe only takes about 15 minutes to prepare and bakes to a crunchy, golden brown within an hour. Norah recommended enjoying it warm, just minutes out of the oven, or if you want to wait a bit, let it cool to room temperature and toast it with a little butter right before you are ready to serve it. 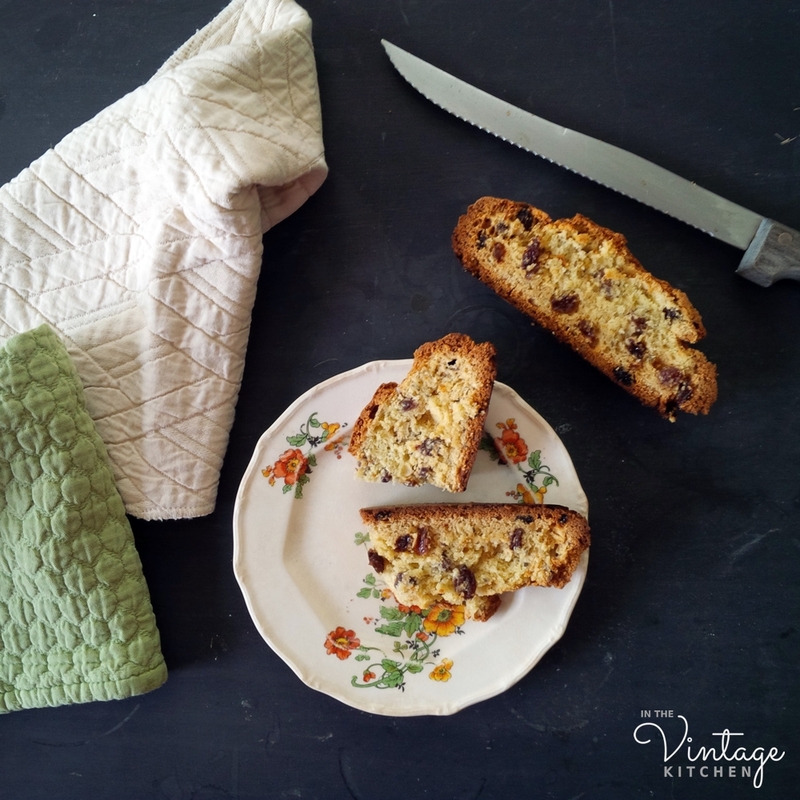 The one drawback of Irish soda bread is that it dries out quickly – so if you are not going to serve it the day you make it, then it is best to freeze it and reheat it when the occasion arises. 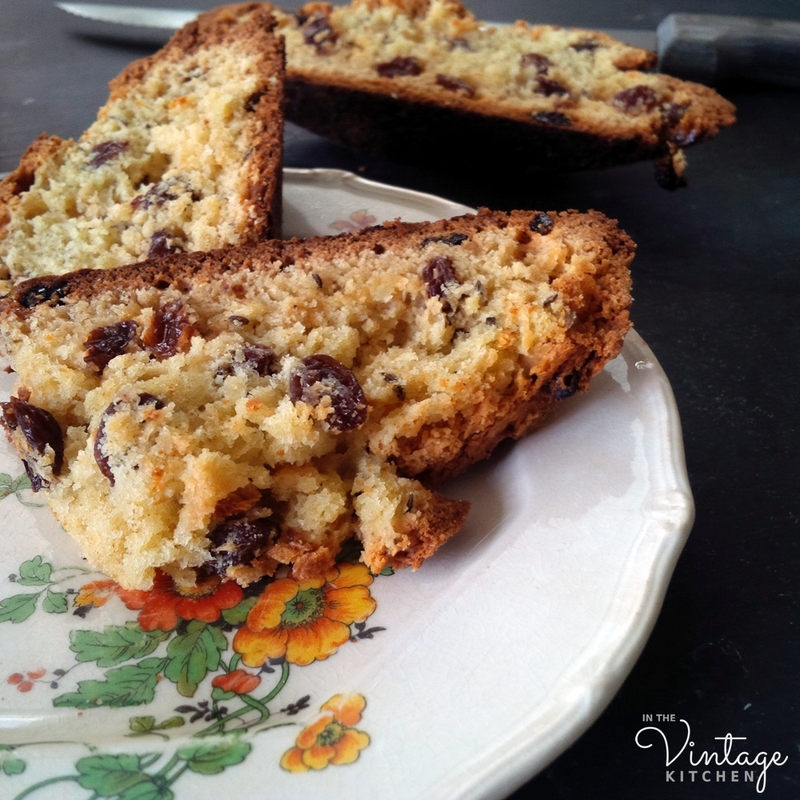 Not as hard as biscotti and not as dense as cornbread, Irish soda bread lands somewhere in the middle as far as form. It pairs beautifully with any salty meat like ham, sausage or brisket for a savory-sweet combo, and would be marvelous with a soft creamy-textured cheese like Brie or goat cheese. In an adventurous mood, we might even top a toasted slice with cream cheese and bacon and kale for an interesting brunch option or serve it alongside baked apples or a chopped salad of pear and fig. In the next couple of months, we’ll be experimenting with Norah’s soda bread recipe, trying out some different food pairings. 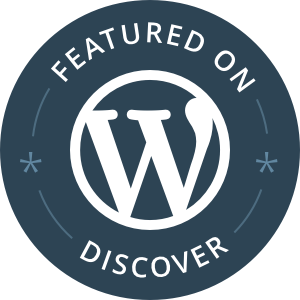 Once we’ve determined our favorites, we’ll post them here on the blog. In the meantime, we encourage you to try this delicious holiday bread and look forward to hearing your thoughts on it. Preheat the oven to 375 degrees. 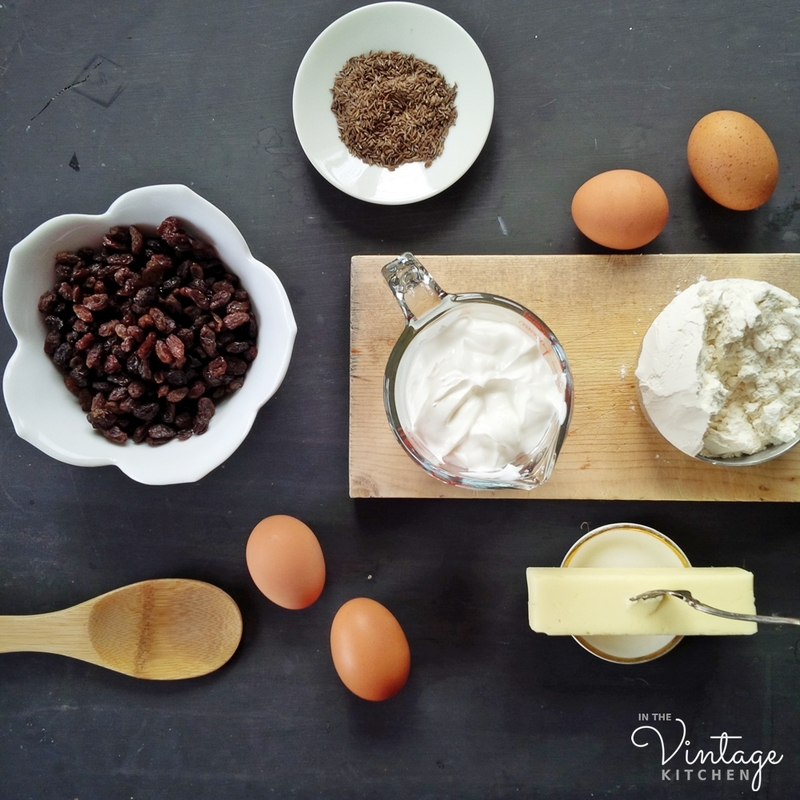 In a large mixing bowl combine the flour, baking powder, sugar, raisins and caraway seeds. 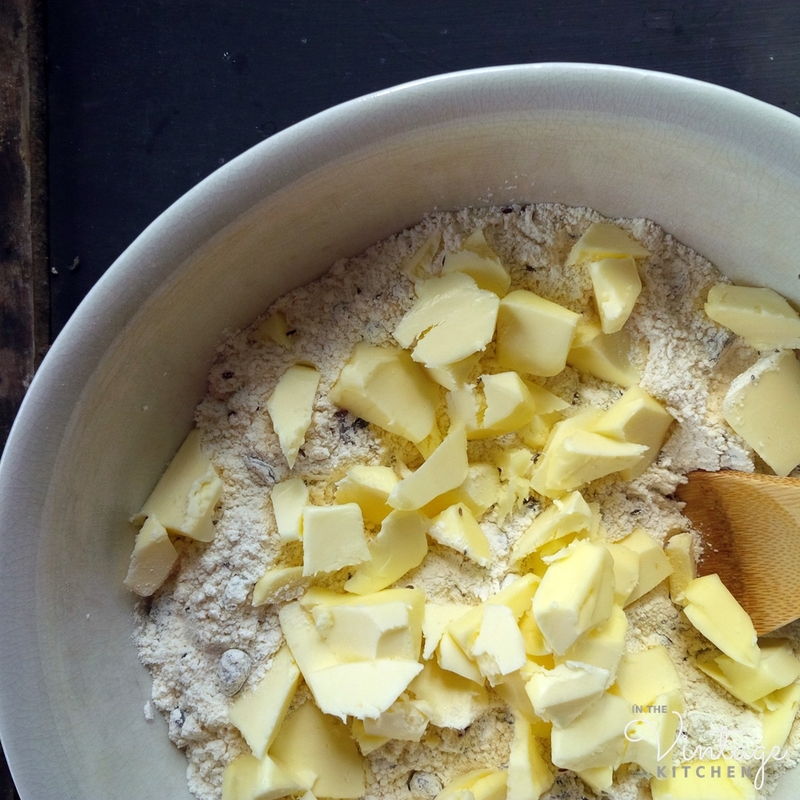 Roughly chop the butter into the flour mixture and combine to the point that the mixture looks like coarse meal. You can do this with the tines of a fork, a wooden spoon or your own two hands. Set aside. 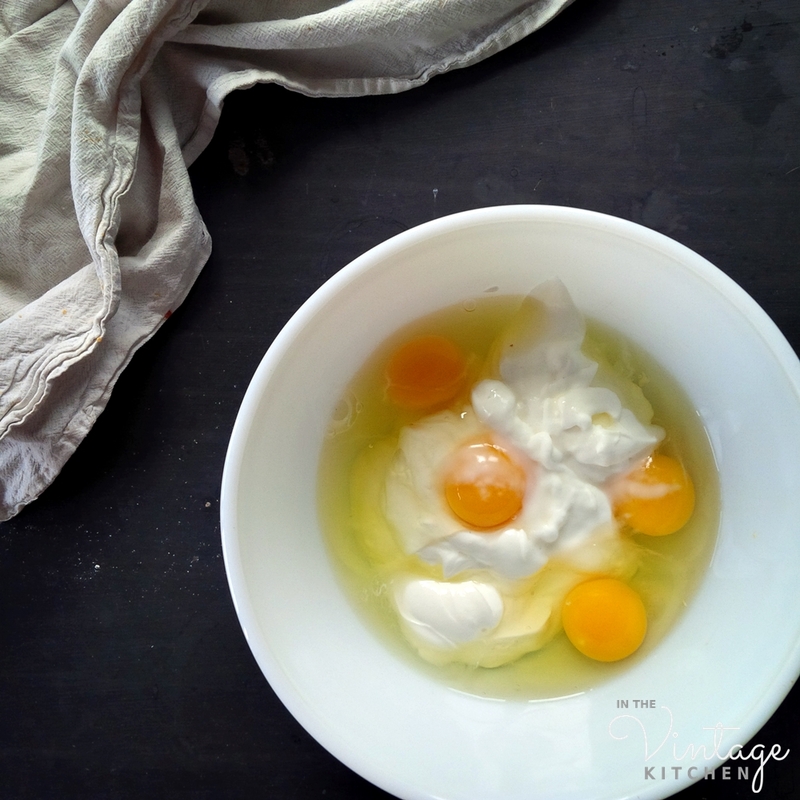 In a small bowl combine the sour cream, eggs and baking soda. 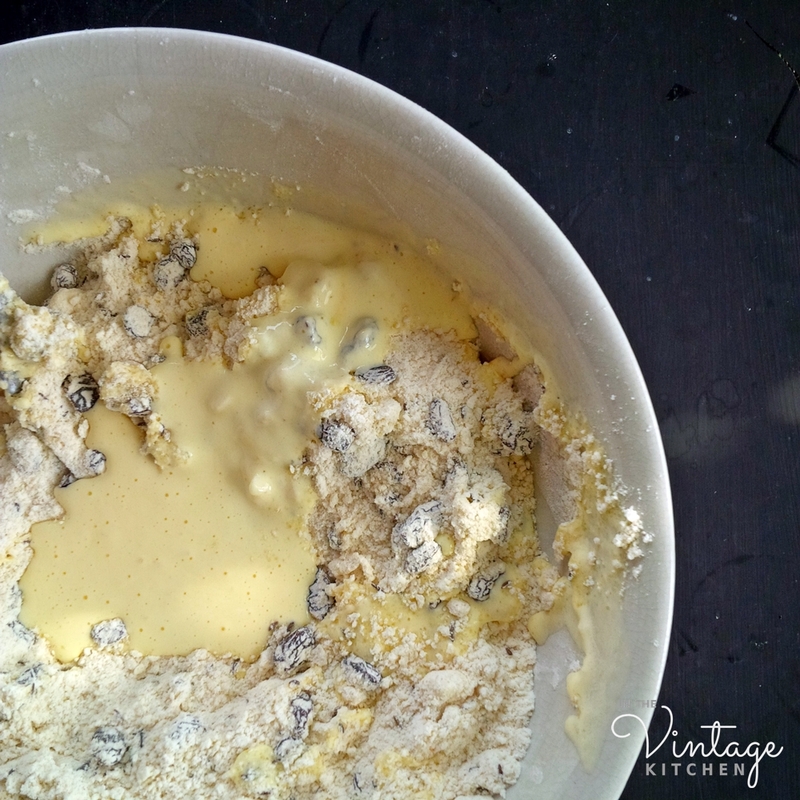 Mix until combined and until the bread is no longer sticky. 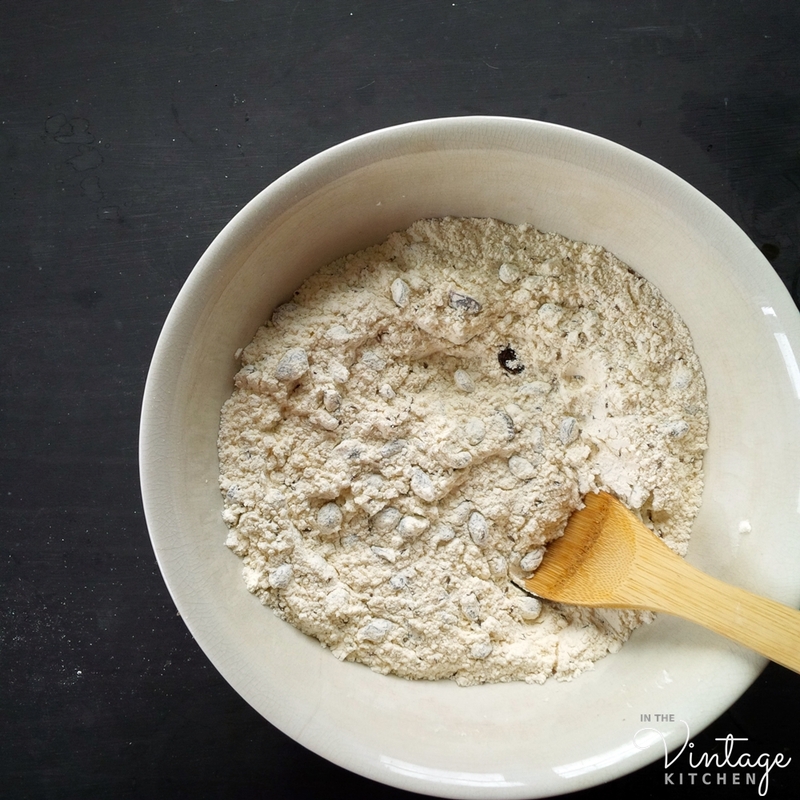 You might need to add as much as 1/4 cup extra flour to this process, but be careful not to overmix the dough. 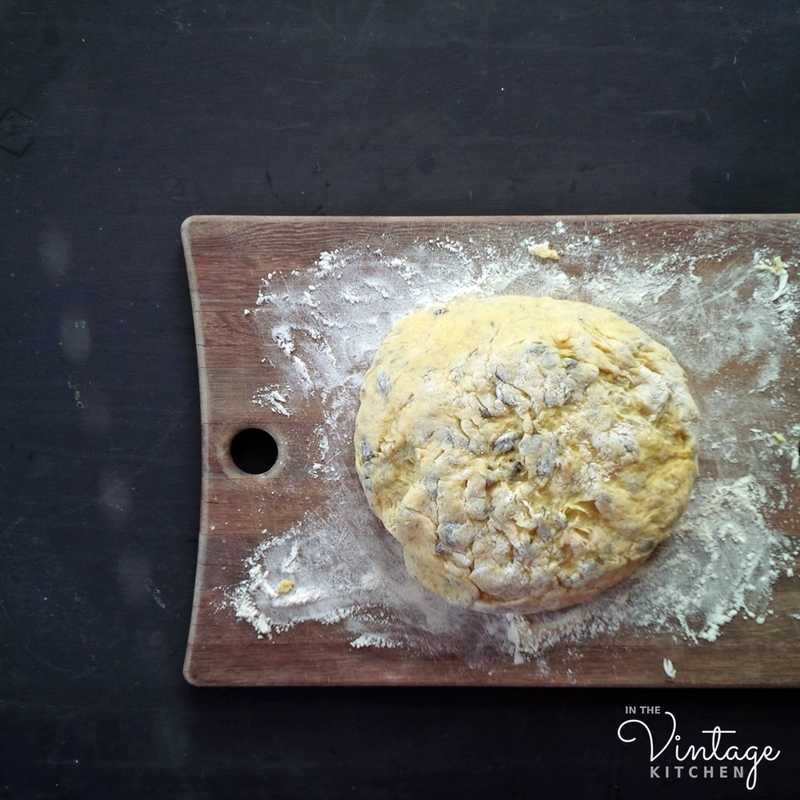 Ideally, you want the dough to be just smooth enough so that you can pick up in your fingers and transfer it to a lightly floured cutting board without it sticking to your hands. 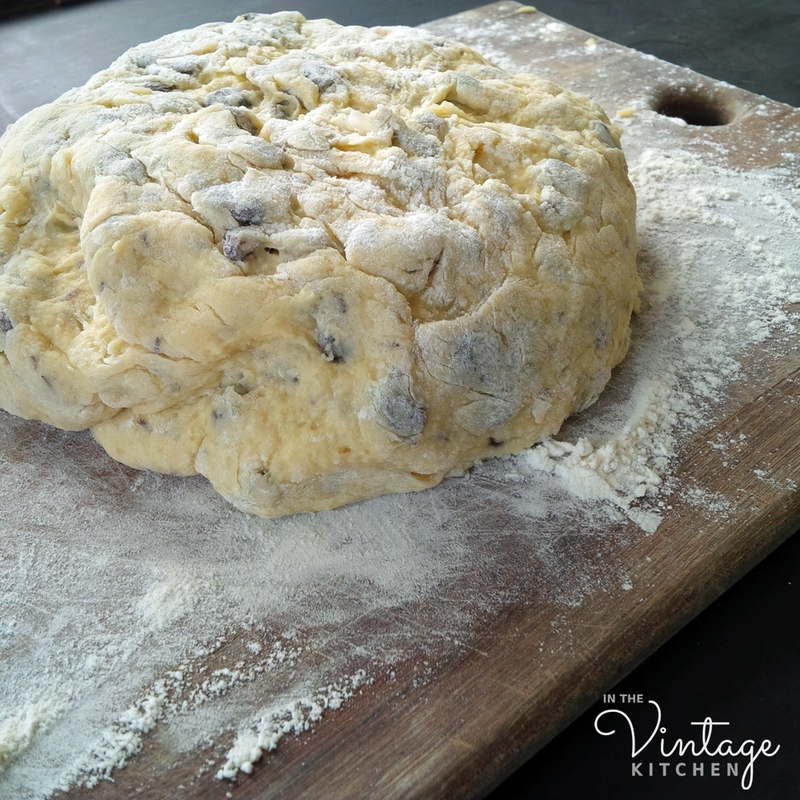 On the board, shape the dough and then transfer it to a greased 2-quart baking pan. 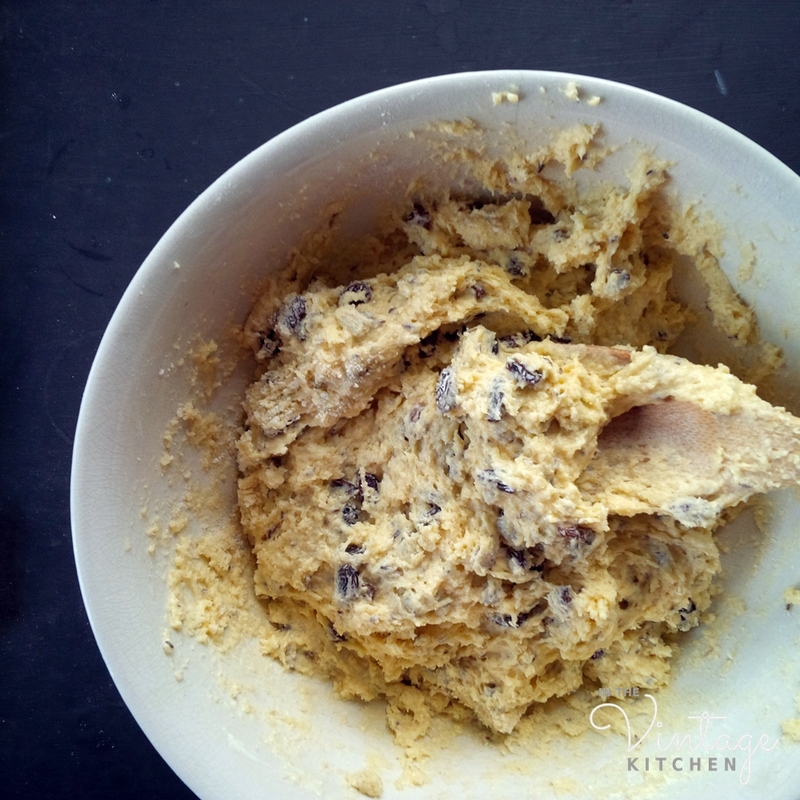 Keep in mind – the dough expands to fit its baking container and then rises – so if are using something other than a 2-quart dish – just be aware that it will grow in size. Bake for 1 hour. Cool on a wire rack for a few minutes before removing from the pan and slicing. However you choose to spend St. Patrick’s Day, whether it be at a big house party like Norah’s, or at a simple celebratory supper for a few (much more Kate Hepburn style) we hope you have a wonderful holiday full of good food, good friends, and good spirits! Cheers to Kate and to Norah and to Norah’s cousin, whose family recipe has traveled across countries and continents and kitchens and time. 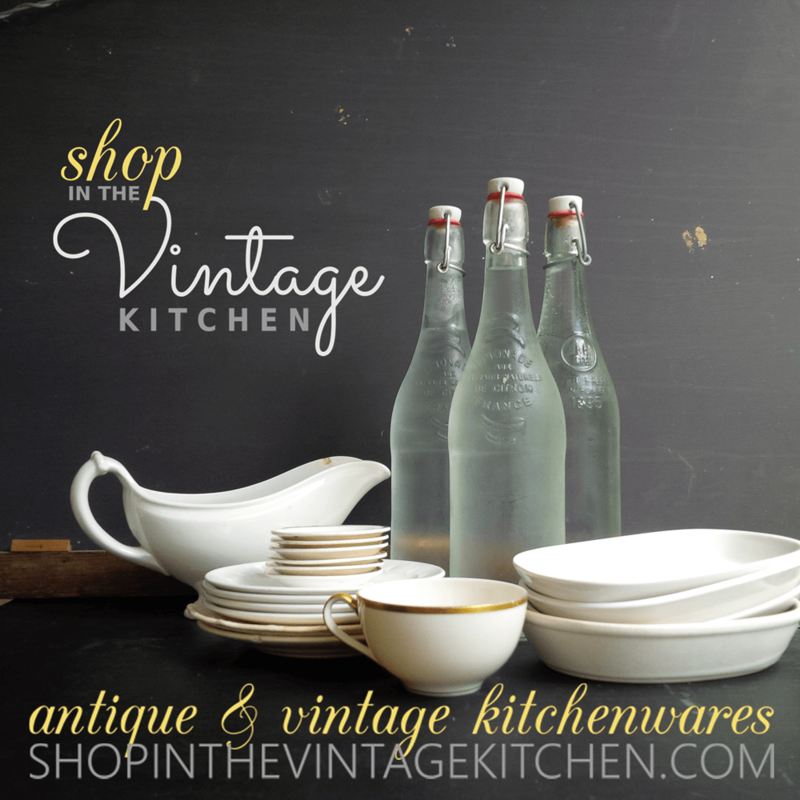 Happy St. Patrick’s Day with much love from In The Vintage Kitchen. That’s Norah (wearing the polka dot blouse) in the midst of her St. Patrick’s Day merrymaking. Next Bacon, Montana & The Family Pie Crust: It’s Tradition Time! Thanks so much! It was so good and easy to make. You should definitely try it!